If you have not tasted Ferndale Farms Lamb before, the tenderness and sweet flavor will make a lasting impression. We harvest fat, finished animals directly off pasture. 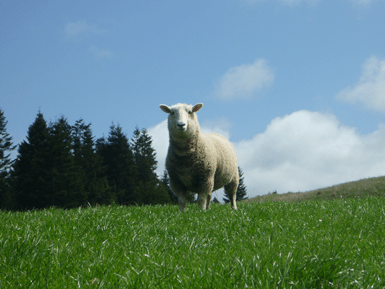 They are raised on fresh hill grasses and lush green lowland meadows which give the meat its own distinctive flavor. We think you will find our lamb to be as tasty as it gets, and absolutely tender. These lambs are harvested at about nine months of age. We sell whole carcass lambs only. One fully butchered lamb takes up about one and a half shelves in an average upright freezer. The meat is processed, freezer packed and quickly frozen. Because nature is not uniform and animals vary in size, so do our lambs. Therefore, we cannot give you an exact weight for each product, only an approximation. Most lamb boxed weights will average between 40 – 50 lbs. You will be charged on the actual boxed weight you receive.